This post was originally posted in March of 2015. The recipe, photos and post have been updated. 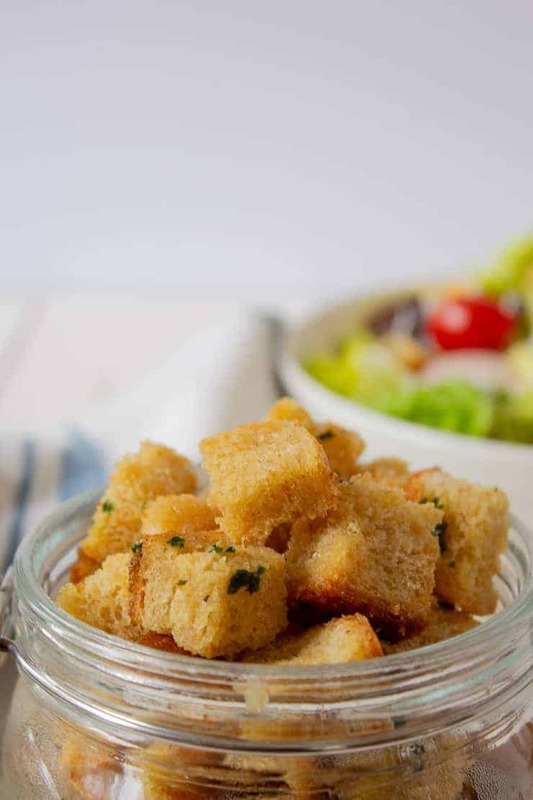 Homemade garlic croutons are so delicious and so easy to make! Croutons are very versatile. You can adjust the taste to fit your individual likes. I love garlic, garlic, and some more garlic….so these are a little garlicky! There are the ends from each loaf that are just too small to make into a sandwich. Fresh homemade bread doesn’t remain fresh for very long. After a couple of days, when it starts to get stale, I save any extra pieces for making croutons. I just throw all the pieces into a gallon freezer bag, put it in the freezer and just keep adding every time I have a piece or two. When the bag is full, it’s time to make croutons! I use slices from my White Whole Wheat Bread that I make regularly. However, you can use any type of bread: White sandwich bread, left over focaccia, french bread, or an artisan style bread. I usually use the extra pieces, but you could use a fresh loaf just for making croutons. It’s all up to you! Croutons are dried cubes of bread that are flavored with herbs. Croutons are often eaten on a salad, sprinkled on a soup or crushed and used as a topping for a casserole. If making from frozen slices, remove bag from freezer and let sit for 30 min. The pieces will have softened, but will still be slightly frozen. The bread is easier to cut in the partially frozen state. Cut into small cube pieces. It’s helpful to have the pieces be fairly even in size. My cubes are approximately one inch cubes. You can make slightly larger or smaller, depending on what you like. Place the cubes in a roasting pan and place in the oven to dry. You do need to stir frequently so the ones on the top don’t get too dry. I checked them every 10 minutes. Once they are dry you pour the delicious buttery mixture over the cubes and then you dry some more. At this point the smell of garlic, butter, and bread will have your mouth watering. You will continue stirring every 10 minutes. I have a really hard time resisting sampling every time I have to stir the croutons….quality control is what I keep saying! Can I use different herbs? You bet! Instead of parsley, you could add dried basil, dried thyme or fresh chives. You could also use a mixture of herbs, if you’d prefer. 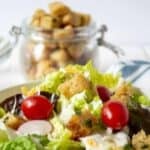 What type of salad is best for garlic croutons? Any green leaf salad is perfect for these croutons. I often use these when making Caesar Salad. Place bread cubes in a large roasting pan. Dry at a 350 oven. Stir bread every 10 minutes until almost completely dry. Meanwhile, melt butter in a sauce pan over low heat. Add garlic. Cook on very low heat for 3-5 minutes. You just want to warm the garlic and release the oils. You will be able to smell the garlic as it warms up. Set aside off heat. When bread is dry, pour butter mixture over dried bread. Add Parsley and salt and pepper. Stir and return to oven for 5 minutes. Stir again and cook for an additional 5 minutes. Remove from oven and let cool completely. Store in an air tight container for up to 2 weeks. 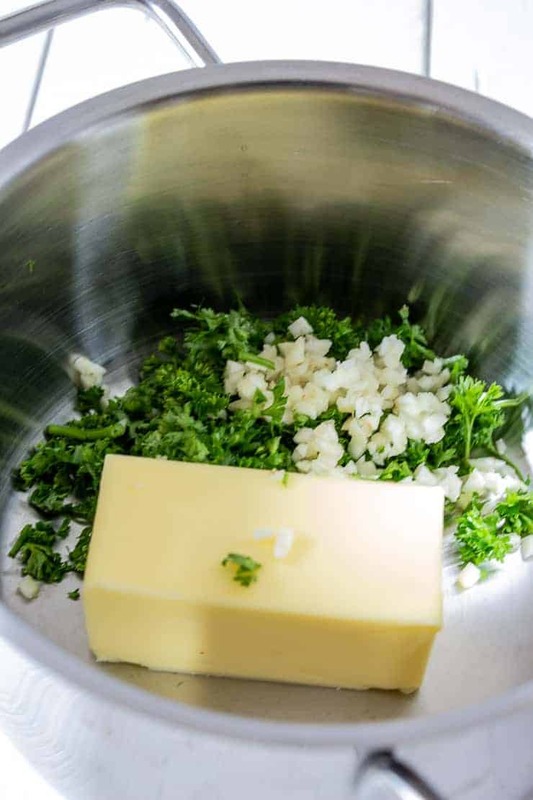 Such a simple and tasty Croutons recipe, Kathy! 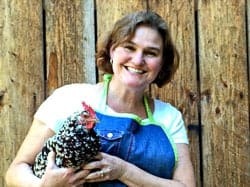 I enjoy making these easy to make recipes at home, as you get to play with different flavors and ingredients of your choice. I could eat these like potato chips, cant have just one! These look so buttery and I can just imagine them dissolving in my mouth with each bite 🙂 . Take care. What a great idea to save the ends of loaves of bread! I do love homemade croutons, but I’ve just used bread that I purposely staled for the purpose. This is a much better route. 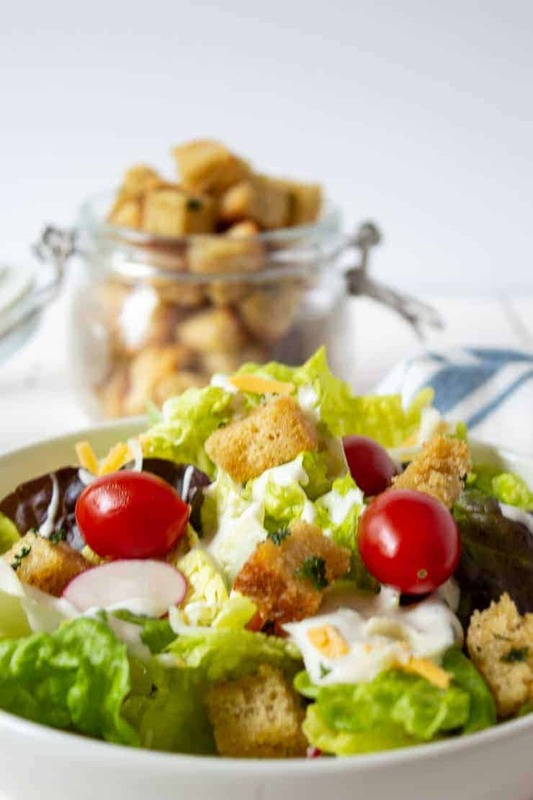 Homemade croutons can take an average salad to an award-winning salad in seconds! 🙂 Love this recipe, Kathy! There are times I have to use fresh bread that I cut up just for croutons. Either way works fine. These look so so good! We love making soups so it’s always great to have a fabulous crouton recipe on hand. Thank you! They are perfect sprinkled on soup. Kathy, these croutons look so crunchy and delicious! They really make a salad special! It’s all about that delicious crunch! I really dislike store-bought croutons Kathy! Homemade are always the best. Can’t wait to try your recipe. Ha! I think that’s actually a great idea! I love croutons in my salad, but sadly my boyfriend HATES them! Oh well, more for me! I guess he just won’t know what he’s missing! They are simple and delicious! I love homemade croutons! They completely make the salad. These look delicious! I agree…they add the perfect crunch and flavor booster! great recipe! I’ve never tried making croutons, thanks for sharing! Thanks, I hope you give these a try! You may not believe it, but I have been making your bread sticks since you posted that recipe a while ago. Like I mentioned in my comment back then, we like bread crust and your bread sticks were just perfect for that. I’ve been making them ever since and we love them. Now, I think I made too much of a batch and I have some extra sitting on the counter. I was planning on making croutons out of them to have with homemade tomato soup. But now that you mentioned garlic and butter, I think I am going for it. Thank you for the recipe and great ideas. Wow, Kimberly! I’m so pleased that those bread sticks have become a favorite! It’s a great idea to use these for the croutons! Homemade croutons are SO much better than store bought and super easy. I’ve made them hundreds of times using all different flavorings, but never used fresh garlic! They look and sound amazing! Fresh garlic is really great, but you can use almost anything with these. 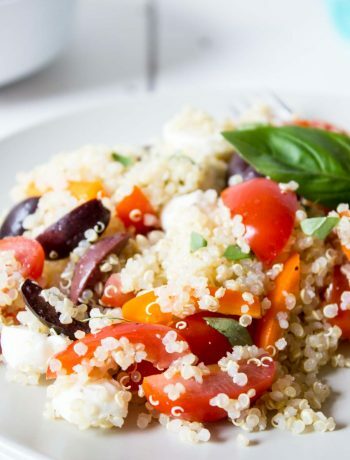 Adjust the seasoning to match a salad or your personal tastes. Sounds like perfect bread for making croutons! 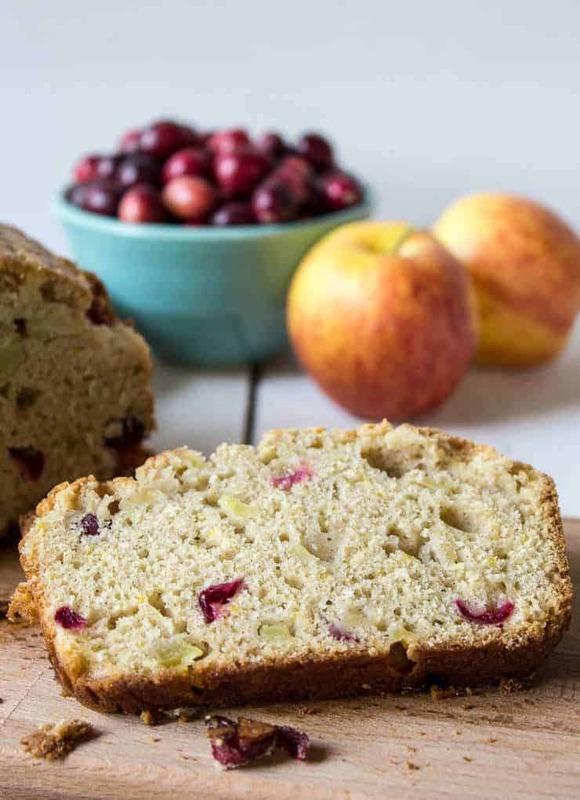 What a clever way to use leftover bread! 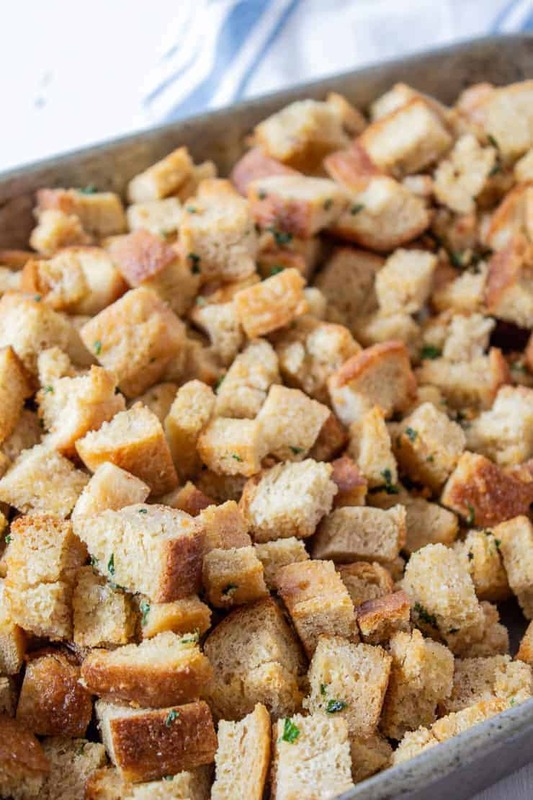 Homemade croutons are the best and bring on the garlic! Thanks Rachelle! The more garlic, the better! I love the idea of making my own croutons! And they are so cheap to make. The bagged ones at the store are actually pricy when you consider how easy they are to make and freeze for later. This is a little project I need to get on asap!!! Thanks for the inspiration. You are right…they are so much cheaper. 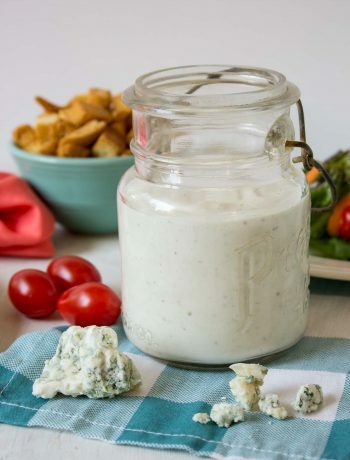 This makes a huge batch and storing in the freezer is a great idea. They will certainly last longer.